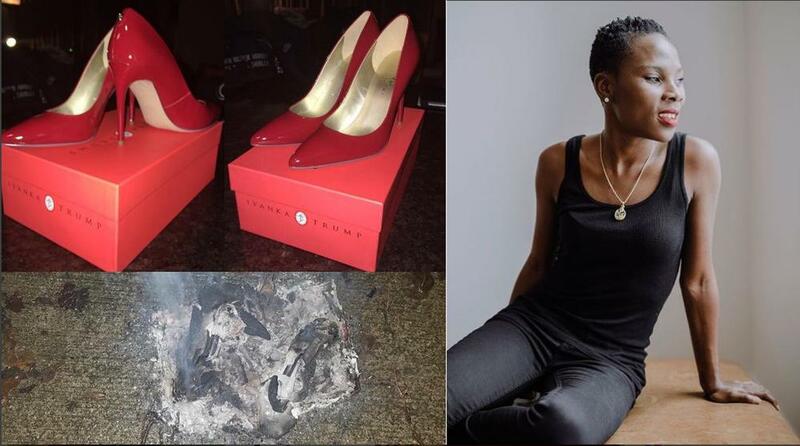 Nigerian-American author and blogger, Luvvie Ajayi, set a pair of her pumps she got from Ivanka Trump‘s shoe line on fire after, finding them in her closet. The “I’m judging you” author said that she got them years ago and never wore them. 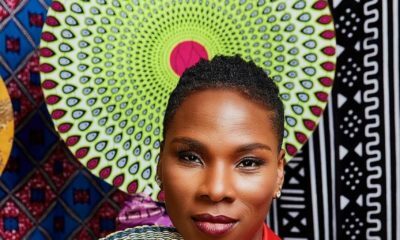 Luvvie is one of numerous African-American artists that have used social media to protest against Donald Trump, from when he was president-elect, and unto his presidency. I was purging my closet and I found a pair of Ivanka Trump pumps I’ve never worn and never will. Just got on Facebook live and burned them to a crisp. You can watch on my FB fan page http://FB.com/awesomelyluvvie. That was cathartic AF. And you know she didn’t? because I follow hr on IG and I remember she voted. This is a terrible act! I can understand the motive behind her annoyance but why not hand those pair of shoes to a charity shop where someone can affordable pick and use them rather them set them ablaze. A true case of “some have food, but cannot eat, some can eat but have no food”. You have several pairs of shoes, we bless God for that, but you can’t wear them all, to the extent you even forgot you had this particular pair, why not give them out to those who are seriously in need of a pair, like they really don’t care even if it was made by Lucifer himself. All those things you mentioned are not going to make her relevant. Stupid, retarded behavior!! She (Ivanka) already got ur money…Why not give it away instead? Salvation army, goodwill…Yea it’s your money n property n yes free country but still foolish behaviour esp as you have a platform. Mschew! Why do you Nigerians have to narrow everything down to money? If it was about money she could probably have returned the shoes and received a refund. This is her own form of protest. Is Ivanka Trump, Donald Trump? Hateful people! The whole idea is to remove the shoe from existence because of who it represents….it’s not about the money but the principle. I agree it’s wasteful…..maybe she should’ve scratched off the Ivanka Trump from the shoe and then given it away…. These are really beautiful shoes.. Like come on. You could have blessed a soul with this. So much more stupid people in America than I imagined. A serious problem. See her face like the shoes she burnt. Dunno what’s wrong with all this senseless sore losers. Hiss! Common sense is slowly fading away from some people sha. …and this is supposed to achieve what exactly? Well, her shoes, her lighter, her headache (or lack of it). I love watching the crybaby leftie bed-wetters throw tantrums just because they didn’t have their way. Their constant moaning and b!tching is a source of tremendous comedy! Not to mention their sweet sweet tears! Ahhhh. Ivanka Trump doesn’t even know YOU! Jeez so many black people full of Hate and always trying to preach Love. i have come to realize that the reason we Africans are saddled with wicked leaders who refuse to leave power is because we don’t understand the importance of protests especially peaceful protests. Protests are how people in many countries cemented their freedoms. Now we Africans desire to be in those countries & queue for visas. Peaceful protests include marches, boycotts, interrupting meetings & burning up personal possessions. So far as you don’t harm another human or their possession, it’s a peaceful protest. Our forefathers understood protest & used it to win liberty from the colonizers. Yet the average African today will never protest against their government and they are also angry to see other people protest! Luvvie is the one who bought those shoes. It is her choice to wear them or burn them as an act of protest against a leader who has mocked all minorities & yet was elected. Why are people upset she chose the latter option? GBAM!! The only person with a sensible comment here!! Seriously the way people are reacting to Trump being President, is going too far!! He is now the 45th President of the USA, and nothing is going to change that, so move on!! A lot of foolish people abound in America, yeye author, Ivanka doesn’t know you, neither does Trump kmt!! Abeg Abeg everyone kam dan! 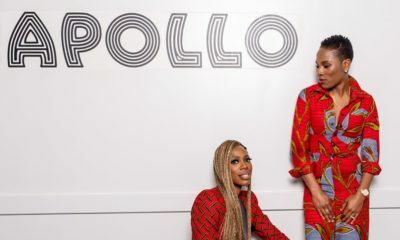 If you dont follow Luvvie on Facebook or Twitter hold your comment. Most especially if you don’t live in America, you wont understand all the protests going on…so just watch. And while youre watching grab a copy of he4 book- im judging you! Remind me, who are you again? And what is weight of your opinion in America? Delusional people ! You protest against Ivanka Trump but hail Buhari, who went from committing treason to being a president. Took seven months to name ministers. inflation out of control. Unarmed protesters murdered day in and out. You didn’t protest for herdsmen massacres, or southern Kaduna killings! Confused, much! !! Big fool. You are the least of IVANKA TRUMP’S problem. People just do stupid things for attention and popularity. The shoe you paid for and Ivanka collected your money already. Stupidity at its peak. Ivanka Trump is made and you cannot do anything about it. LMAO walahi, Nigerians deserve the leaders they get. You guys truly do not understand that it isn’t about the money or about whether Ivanka knows her or not????? Chaleeee, my people have perished. But it makes sense, the way things work in Naija are those two things: money and connections. This is really absurd! Who paid for the shoes? Whether you burn or not, the person wey you dey vex for no see you… I mean… some people have no shoes and all you can do is proudly display the ‘apa’ nature in you! 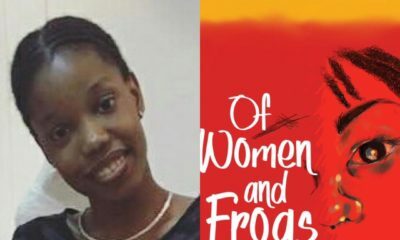 This babe should be slapped for what she did! You should have given them out to someone shoe-less and received blessings instead! Have human beings suddenly lost all sense of reasoning? This is quite bewildering ! May this madness roll by quickly! Hypothetical situation: If for instance the U.S.A elected a gay president in a gay marriage, and I take the shoes from that gay president’s company and burn it, just to protest that I don’t agree gay union should be a thing, or that I think he would oppress those who don’t believe in gay unions… Would the world still see my protest as normal and my right? Or wouldn’t I be termed a despiteful hateful terrible person? Terrible double standards in our times.